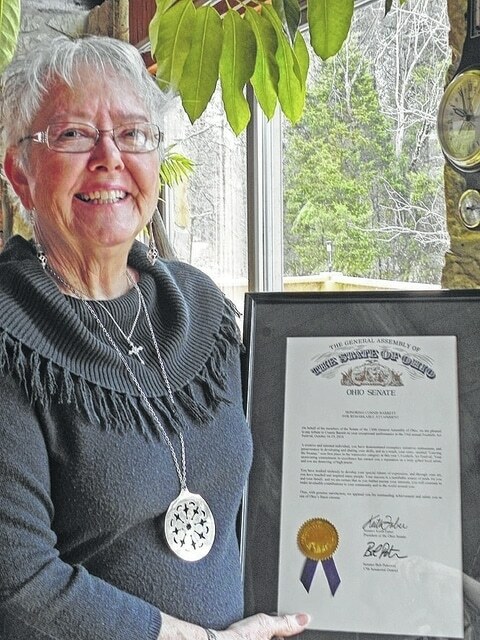 Connie Barrett is pictured with the letter of commendation she received from the Ohio General Assembly. Connie Barrett, a gifted watercolor artist and member of the local Brush & Palette Art Guild, received a letter of tribute earlier this year from the members of the 130th General Assembly of Ohio, honoring her for her exceptional performance at the Foothills Art Festival. Barrett received this endorsement as recognition of her commitment to excellence earning her a reputation as a gifted artist deserving of praise. The tribute commends Barrett for her “initiative, enthusiasm and perseverance in developing and sharing” of her skills. Barrett’s dedication to her passion in art earned her a first place award in the watercolor category with the entry, “Leaving the Swamp,” at the 33rd annual Foothills Art Festival held in Jackson last October. The letter closed with appreciation of her achievement and salutes her as one of Ohio’s finest citizens. Barrett has indeed shared her “special talents of expression with the art community,” the letter says. Submitted by Mary Braun, Hillsboro.